“I can’t wait for chukar hunting season,” Bob said just yesterday. We have just over 6 months now. We need time to recover. These are some snapshots of the 2015/2016 season mostly from down in the Hells Canyon National Recreation Area and a few at the Cecil Andrus Wildlife Management Area. We feel blessed to live in a state where we can access lots of quality, picturesque public lands for hunting and other recreation. We hope it stays this way. 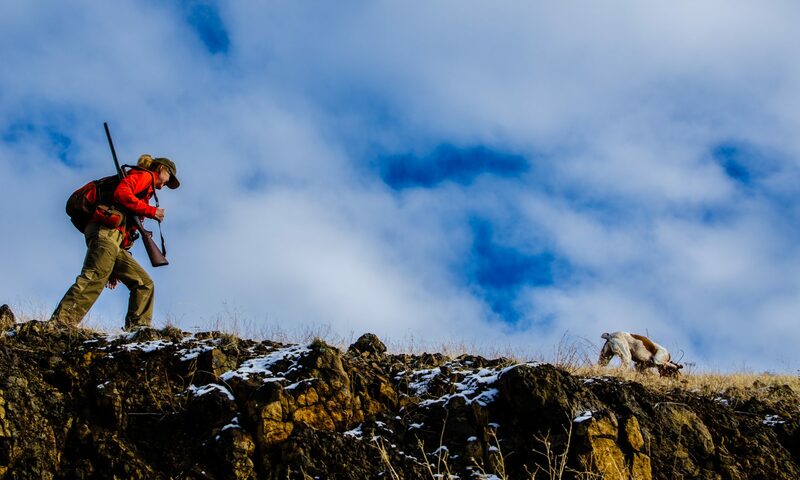 If you’re a chukar hunter, you’re well aware of the fact that some very misguided (or worse) folks are trying to have our federal public lands transferred to state control out west, which could very likely be the end of hunting, or any kind of use, for the common man and woman (not to mention the fact that many state constitutions – including Idaho’s – specifically disavow any future claim on federally owned land). As Americans and joint owners of this public land, this is the greatest legacy we can leave future generations. You can’t put a price tag on that. Agony (Peat eats the first chukar of the season). Heading back to the pickup. Great photos as I have said of all the chucker hunting videos and photos yours are the best. My shooting this year was poor and has been on the decline for the last few I’ve decided to spend my next 6 months retraining starting with the basics of shooting. Got a book The Instinctive Shot by Chris Batha Bob may want to check it out there are videos online but the book is in more in depth. Thanks again for the fun this year. Thanks, James. I’ll check out Chris Batha’s book. I’m considering switching to left-handed shooting to see if my left-eye dominance feels better on that side… I’m sure there’ll be a post on that at some point… Best of luck! Bob I am also right handed and left eye dominate and have used with success a magic dot on my Decot hi-wyd shooting glasses check out the Decot Sporting Glasses web sight. Awesome. Thanks for the treat, especially in March. I miss all of that, even the uphill climb. Jay, thanks for the nice comments. Those uphill climbs are addicting in some sort of weird torturous way. I have read a lot of your posts and enjoy them. I have never hunted chukar, but am contemplating making the trip this Fall from Atlanta to the Cecil Andris / Hells Canyon area. Can you offer some advice on where to dive into it? It’s pretty massive area. To be honest, the winter decimated the birds in the Andrus area/Hells Canyon. I have no advice other than maybe look at other lower-elevation areas that didn’t get hit with the amount of snow we got. I don’t plan to hunt my normal spots because I have seen little evidence of any substantial over-winter survival. Worst I’ve ever seen. Sad.